The new financial year started with a bang as the S&P BSE Sensex rallied over 400 points in intraday trade on April 1 to surpass its previous record of 38,989 (August 29, 2018). Banking stocks led the current rally in S&P BSE Sensex as the top three stocks which rose over 10 percent were from the banking pack. 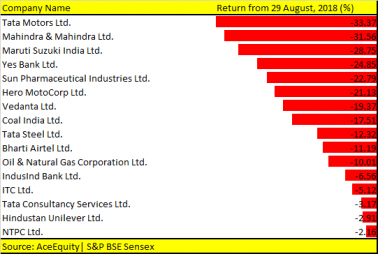 As many as 14 stocks in the S&P BSE Sensex gave up to 18 percent since August 29 when the index hit its previous high. List includes Axis Bank, ICICI Bank, HDFC Bank, Bajaj Auto, Asian Paints and Reliance Industries Ltd. The large part of the rally was led by domestic money as foreign investors turned net buyers only few months back. According to data compiled by Moneycontrol, FIIs have pulled out more than Rs 20,000 crore. FPIs remained net sellers almost throughout the recently concluded fiscal except for the past couple of months. October emerged as the month of steepest outflow with FPIs pulling out a massive Rs 38,900 crore from the market, according to a PTI report. The comeback of FIIs has given support to the bulls which were earlier standing on the sidelines. One big factor which is fuelling the rally in markets is the movement of smart money in stocks like HDFC Bank, RIL, Infosys, TCS, HDFC, ITC and Kotak Bank which represents over 40 percent weightage in S&P BSE Sensex. But, can we say that the rally is over? Well, maybe not. Experts feel that the momentum is here to stay and we could see higher levels in April. The index entered unchartered territory and the index could well rally towards 39,500 levels, they say. “Fresh highs were bound to happen as the force behind the trend looks intact for the further gains that may push Nifty to touch beyond 12K mark and Sensex beyond 39,500. Lower inflation, lower interest rate scenario, a dovish stance from Fed reserve and liquidity-driven markets, all these factors are favoring the current scenario,” Mustafa Nadeem, CEO, Epic Research told Moneycontrol. Nadeem further added that there may be some minor profit booking in the short-term due to strong resistance near 39,000 and 11750 levels on the Nifty. Dalal Street is also looking forward to RBI meet in this week and expects a rate cut. More than 50 percent of index constituents gave negative returns in the S&P BSE Sensex since previous record highs. 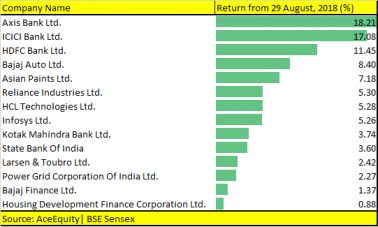 As many as 16 out of 30 stocks fell up to 30 percent since August 2018 when Sensex last touched record highs. Tata Motors fell 33 percent, followed by M&M which saw a decline of 31 percent, Maruti Suzuki was down by 28 percent, and Yes Bank fell by 24 percent.